Are scarves the new 'power' accessory for women? 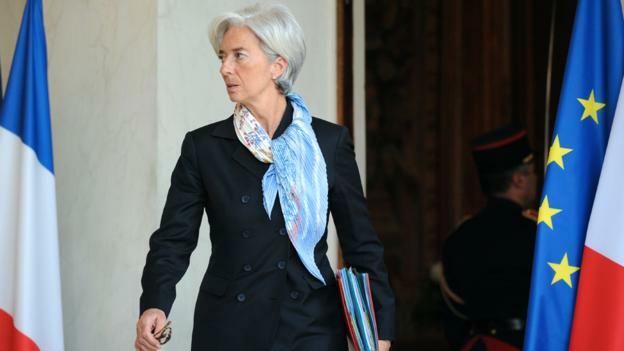 When International Monetary Fund Managing Director Christine Lagarde goes to the G8 summit in June, she may well be wearing a scarf – a fashion accessory that she’s become known for, and one that’s been drawing more and more attention. In fact, the BBC recently identified scarves as a “new power symbol” for women. True, just as some men choose amusing neckties to enliven monochrome suits, many women who work in an atmosphere that requires conservative business apparel will wear scarves to add a fillip of color and distinction. But the trend is anything but “new.” In looking at the history of scarves in the 19th and 20th centuries, it’s clear that the allure and power of scarves has always existed – and persists. The scarf is the most simple form of adornment: a single piece of cloth. For this reason, it’s one of the most versatile clothing accessories, used for centuries across a variety of cultures, for a range of purposes. Many Muslim women wear headscarves for modesty, while ladies of a certain age favor scarves with a triangular fold to protect expensive or elaborate coifs. A scarf can be a political statement, and can denote a wearer’s affiliation or beliefs. Early 20th-century crusaders for women’s rights used their clothing to promote their cause, wearing scarves in the movement’s colors: white, green and purple. But in Western culture, the scarf is most prominently known for its use as a fashion accessory, one that first gained widespread popularity in the 19th century. The fichu is a typical 18th- and 19th-century style that can be seen as the forerunner of modern scarves. A piece of fabric worn lightly draped on the upper chest and usually knotted in front, it provided modest covering but was also an opportunity to add an especially fine textile – sometimes lace edged or embroidered – to an ensemble. Lightweight, finely woven silk and cashmere shawls from India were one of the first fashionable scarf styles. Empress Joséphine – the first wife of Napoleon – had an extensive collection (thanks to her husband’s travels), and the style persisted through much of the 19th century, spawning cheaper imitations fabricated in other parts of Europe, notably France and Paisley, Scotland. Like much of high fashion, scarves can signal one’s status, and limited edition scarves – often only made available to favored customers – can act as specific indicators for those in the know. The restaurant’s owners commissioned well-known designers, and each year’s scarf design referred to some aspect of the restaurant – its famous façade, the collection of jockey statues outside or the number 21. Actress Lauren Bacall, an esteemed regular, donated her 21 scarves to the Museum at New York’s Fashion Institute of Technology, where other pieces from her wardrobe were recently exhibited. As a discrete space, a scarf presents an opportunity for experimentation often not available in other realms of dress that are determined – and restricted – by the shape of the body. In London in the 1940s, Lida and Zika Ascher initiated their “Artist Squares” project, enlisting an international roster of prominent artists to design large scarves, a group that included Henri Matisse, Jean Cocteau and Henry Moore. The Artist Squares were sold in major department stores and also exhibited – framed, like paintings – at London’s Lefevre Gallery. To celebrate her new couture salon in 1935, the designer Elsa Schiaparelli made a collage of her press clippings and had it printed as fabric for scarves and other accessories, turning black and white type into a striking motif. A scarf by the American designer Vera offers another variation on lettering as ornament, presenting the titles of international newspapers, each in its distinctive typeface, on a vivid yellow background. Certain labels are particularly associated with high style in scarves. Ferragamo, Fendi and Gucci – all originally esteemed leather goods houses – now produce desirable scarves. But for prestige and polish, Hermès represents the pinnacle of scarf culture. Several aspects of its business have contributed to the company’s reputation. Founded in 1837 as a supplier of equestrian supplies, Hermès began offering scarves, called carrés, in 1937. Their focus on exclusivity has encouraged an almost fetishistic loyalty among customers, many of whom could more properly be termed “collectors.” Limiting the number of designs they offer each season has maintained Hermès’ mystique. The company’s focus on craftsmanship helps justify their reputation and high prices; Hermès takes pride in the impressive number of colors in each design, the hand-printing process and the fineness of their silk, positioning their output as artisanal creations. While not at the level of Hermès, the American accessories company Echo, founded in 1923, also has a loyal following. The firm pinpointed the essence of the scarf with their memorable ad campaign “The Echo of an Interesting Woman,” introduced in the 1970s. In contemporary fashion, scarves continue to serve the same functions as those earlier fine linen fichus and paisley shawls; they denote connoisseurship and sophistication. It’s no surprise, then, that sociologist and image consultant Anna Akbari makes “Put on a scarf” the first entry on her current list of “5 Simple Ways To Hack Your Image,” recognizing their potential for instant uplift and an infusion of individuality. Nancy Deihl is Master Teacher and Director of Costume Studies at New York University.